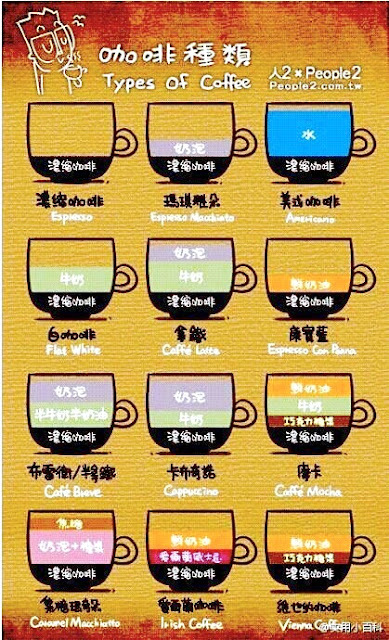 A friend of mine share a Coffee Chart to me recently, I saw an English version many years ago but not this, in a format with their Chinese name (actually I think there are Taiwanese translation). It reminds me the first time when I was looking for a cup of Latte in Starbucks at Guangzhou, if translate directly it called "carrying iron".......well well, of course it sounds in Chinese is good fit to match with the pronouncaton of "Latte", but nothing related to it's actual meaning. Same goes to Espresso Con Panna, no related meaning to it's 3 Chinese wording of "Health+treasure+blue". When you want to have a cup of coffee, which cafe will you choose to enter, base on what? it's degree of well known? interior atmosphere? no. of customers inside? coffee menu choice? 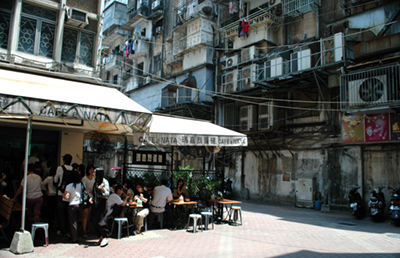 This cafe is located in Macau, people's favor of...guess what, not coffee but their Portuguese egg tart. 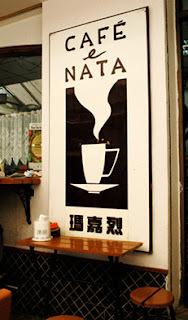 The day when we were visited, very crowded, aroma of egg tart spreading in air, but the most attractive element was the shop itself and this signage, very vintage. Truly speaking it was not a fabulous design but it's eye catching, and created a perfect mood together with the tiny timber bench, stool and "tissue roll" setting in front. Well, of course mosaic tile will always be the "green leaf" here in Macau. It's interest to say that, people love coffee is more or less a bit sensational, even if this is not their usual act; but they are obsess to the feeling of freedom or wildness at that specific moment with a cup of coffee in hand. So, my conclusion and what actually did happen was, our internal sensation conquered the reality that leads us to seat down there, no coffee, just egg tart + watermelon juice ; no service, no atmosphere, no variety choice of coffee, no gimmick...but it's already free our mind as we were seating at the side walk cafe , enjoying our "special moment". 不知離開了多少個年頭, 每次重回舊地, 都會待在這裏好一陣子, 今次也不例外, 只是若有所失! 澳門急速的發展令這間位於氹仔, 一向以擁有太白渡假村為特色的凱悅酒店也靜靜地起了變化. 名稱巳變成麗景灣酒店, 入面太白渡假村面積縮少了, 我想, 有四分一罷, 周邊被高樓及其他以招呼賭客為首的酒店包圍着, 要看藍天白雲只得往某個特定方向望過去. 酒店內部翻新了, 大堂變得昏暗、中國化, 自助早餐不再有"陽光", 食物變成不中不西; 錫紙包裝的沐浴露不再散發着"渡假式"的清幽, 如果離開泳池旁邊這段長廊, 踏出了太白的範圍...真的, 我所熟識的渡假酒店巳在退變, 漸漸地消失. 從大堂的酒店發展模型可見, 為着成就新加入的賭埸設施, 眼前的一切將會再進一步改變, 這段富有萄葡牙及少少Art Deco 設計風格的建築還能保留多久呢?位於泳池邊, 已停止運作的水中酒吧仍能佔據所緊餘的空間嗎? 最愛的芥茉黄, 湖水綠, 松綠, 紅鶴粉紅...簡樸天然的素材...仍能看見嗎? 要留住這 一切, 似乎不可能, 只願, 仍有"惜花者". 5 years. 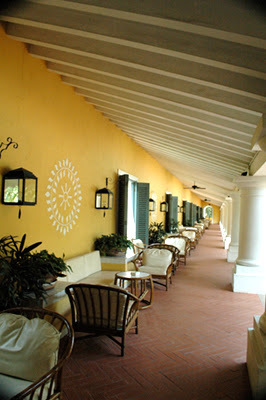 10 years....I can't remember when was my previous visit, but every time, it's for sure I will stay as long as I can in this lovely veranda, relaxing and enjoy the wind breeze...but this time, I am "lost". Regency Macau was originally named as Hyatt Regency located in Taipa island of Macau, it was a resort built in Portuguese style with a touch of Art Deco, you can see all the familiar color combinations of Flamingo red, Turquoise, pine green, mustard yellow + white, of course...with those natural interior materials. But, the truth is, how long can these elements been reserved? The rapid growth of "casino culture" in Macau is intruding into this hotel. It has been renovated not long before and it's not difficult to be identified the changes of it's dark interior in lobby, the greenery at pool side area was reduced in almost 1/4, what you've got around are high rise and casino oriented hotels; if you want to enjoy a bit of blue sky, please, fix your view angle and ignore the surrounding. 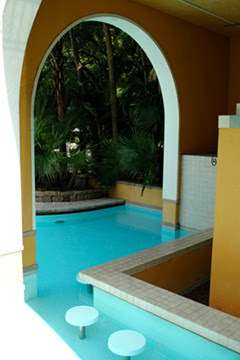 The "fast food style" buffet cuisine, the replacement of bath kits in sachet, paper lantern instead of sun light as your breakfast companion, etc...all reminds you the resort is no longer exist. The transformation is still in progress, there will be a new casino facility in this "Taipa resort", you can imagine what's up?! 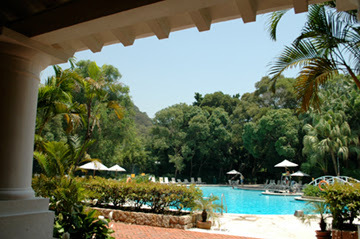 Hopefully, some one will remember this forgettable pool bar which deserved and worth to be here. 抱歉相片有點矇, 正如我用這件產品時的感覺一樣, 又愛又恨再加點迷惘. 不得不承認沒有做家庭主婦的材料, 這種可摺合式的乾衣網,對不少主婦來說是一個好幫手. 要陰乾毛衣或織物時, 可打開把衣物平放,掛於浴簾通或懸空放在浴缸邊上, 防止纖幼的衣料因用衣架掛起時下墜變形, 不用時又可摺合收藏; 但我想...究竟有多少用家真的會這樣摺摺合合呢? 因為這個由細網變大網, 再由大網變細網 (約縮少1/2) 的戲法是靠扭曲一個鐵線圈造成的, 方法請參巧上圖三步曲. 但事實上, 運作起來又不是如比輕鬆, 每次總給"反彈"數次才可完成摺合, 結果, 我還是把它完整攤開備用, 省卻再摺來摺去的"手續". 令我想起設計師設計這件產品時, 原意是很理想的, 尤其適合香港和日本等居住環境較擠迫的用家; 但礙於成本限制, 為要令成品不會脫離消費羣可負担的現實, 物料上的選用往往成為首個犧牲的項目. 說到底, 一件十圓八塊的產品, 也不應有太多要求罷! This blur image is exactly of what my feeling while using this product, I love it's idea, reasonable thought of usage but always with a bit of frustration and messy; although, I must confess that I don't have the talent of being a good housewife. 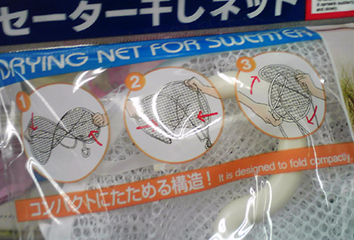 ...in reality, due to the cost control, I think; it's not as easy as just twist the hard metal ring around to fold it up each time after use, without rebounds several times. I always wonder how many user will repeat unfold and re-fold while doing their laundry? To me, I just hang it 365 days unfold as a result. It will be great if the metal ring can be modified by using a more soft & flexible material with adequate support and waterproof...hey hey hey...should we ask for too much to a product that only cost a few bucks? what do you think?